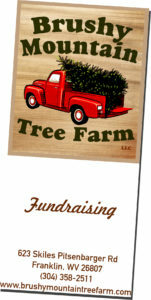 Brushy Mountain Tree Farm is excited to offer a fundraising program. This program is a great way for any organization to raise money. This would be a great way for any sports team, church group, boy or girl scout group, or school group to raise money. Currently, Brushy Mountain Tree Farm offers Douglas Fir and Concolor Fir for the tree fundraiser. Wreath fundraising is also available. Contact us for more information.